I'm used to working with multiple windows spread across multiple desktops and my project files are set up to facilitate that. I think I will learn to like tabs, but for now, there are lots of occasions where I will be using multiple windows. So I have some questions about how TBX6 handles them. 1) In TBX5 when I reopened a project, all my windows and their positions were restored to their previous states, but in TBX6 only the window that was active on close reappears. Is there a way to have all my windows that were open at close reopen? 2) Is there an option or a modifier-key-combo that makes in-text links open into a note text window rather than switching the focus of the text viewer? The default behaviour takes me away from the note I'm working on. I then open the linked note in a text window and return to my previous note. Just wondering if there's a way to eliminate the follow-link/open note window/back-to-work loop. Thanks in advance for any info or suggestions. Full-featured windows show the current selection, though text updates are deferred when the window is not active. Deferring updates avoids performance trouble for fast typists. What you want, I think, are auxiliary text windows. ⌥⌘-X or View:Text Window opens a dedicated text window for the selected note. Also useful are torn-off Get Info windows. This is an issue that came up during the beta process. Like you, I've often used multiple open windows in TB5. As a design-clarification point for MB: When you close a multi-window session with TB6, is it the window that was last active that reopens? Or the window that you first opened in the previous session? Thanks. The auxiliary text windows help. I hadn't thought to tear of the info window, but I'll try that out too. In TBX5, when I clicked on an in-line link, a new window opened showing the destination note's text. In TBX6, when I click on an in-line link, the destination note's text replaces the source note's text. I now start and finish with one window. Is there an option or modifier key that produces something like the old link behaviour in TBX6? Perhaps by opening the link directly in an auxiliary text window? Not opposed to the change in principle. Just wondering if I'm missing something. Originally TB5 re-used the text windows. It's actually a v5 Text preference: "Keep windows open". Anyway, TB6 has no method to do open new (tear off) text windows. I guess that's a feature request. Is there a way? One of the strengths of Tinderbox for me was (is?) the ability to work with different views of the data open at the same time: for example, work on an outline while at the same time having a map or timeline view open. I finally figured out (not intuitive for me) that it is possible to accomplish that by going through a sequence of steps: add a tab, change its view, then right-click it to move it (actually it appears to "copy" it, leaving the original tab) to a separate window. So, with extra work, I've managed to get what I had before. But then, when I go to File > Close to close the file, only that window closes (not what one would normally expect from that menu pick). And if I leave both windows open and quit Tinderbox and reopen the file, alas, only one window opens, so I have to go the sequence again. From using it through betas over the months, I think TB6 is overall a huge step forward in functionality and elegance. I think you've identified one of the few areas where, at the moment, it's not as convenient as the predecessor. In general, I've adjusted to the single-window/multi-tab approach of TB6 and see its convenience. But some times I do want to see several different windows at once. You can set this up, but as you point out it doesn't survive from one session to the next. I don't know whether that is adjustable-- if so, I hope it will be adjusted. Again, in perspective this is one step back with scores of steps forward, but it's a little feature I miss. As I've begun to adjust to the change (and said goodbye to my floating windows), I think I like the tabs! But they do change how I think about how I group my projects. My work breaks down into three large "fields" that are distinct yet can frequently overlap or interact. In TBX5, I used one project file that was organized with three top level containers that corresponded to the three fields. In daily use, I treated each of these top-level containers as a mini-project file and opened each one up in a different desktop. The possibility of interaction between fields was there, but when I moved a window from one desktop to another, I didn't have to worrying about which project a particular window belonged to: there was only one project. Now with TBX6's tabs and split view, there seems to be no possibility of confusion and I'm thinking of breaking my top level containers off into their own projects. My daily use would then involve opening the three projects (each with its own set of tabs) in three different desktops. I'd have the same level of access and complexity but in what seems to be a simpler interface that will work well on my MacBook Air. I have evolved toward something like this, too, and agree that it's very powerful. There are still some cases when I would like to have different windows open on the same project or file, but most of the time the approach you describe does the job. Thanks for explanations. Not being able to (easily) have different views open and visible at the same time (for me) takes much of the Tinderbox out of Tinderbox. I had thought for a moment that by dragging the divider to the middle I'd be able to have two major views side-by-side (à la Scrivener). But that right pane seems reserved. Will continue to poke around. If you want more 'major' views on display open a new window for each. You can move the splitter pane to give more room - N.B. the Window menu items that let you toggle (shortcuts too) all left pane, spit or all right pane. I do realise there's a slight issue about TB remembering which windows were open in the last session but I'm sure this will be resolved. Six seems to be missing hoist: whether directly in Outline view or by opening a map from deep in the structure of an outline. I especially appreciated this ability to "narrow" the map view down to just a selected section. It would be a feature to restore in a future version. It's there. In map view, select a note and press down-arrow. In outline, right-click the note icon. Or select the note and choose FOCUS VIEW from the View menu. 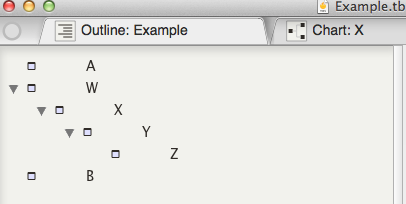 In Outline, right-clicking the note icon reveals the list of prototypes (as in v5). To 'hoist' a container in Outline either double-click the note's icon or use Focus View in the Note menu. In map view, as in v5, there are keyboard shortcuts to hoist (drill down) or un-hoist. Either the Up-arrow or Cmd+Up-arriw will un-hoist the current map, moving focus up one level of outline. To drill down (hoist), first select a container on the map and use the Down-arrow or Cmd+Down-arrow.